The AcoustiPack is the last word in acoustic material kits - for customers who demand the very best, here it is! 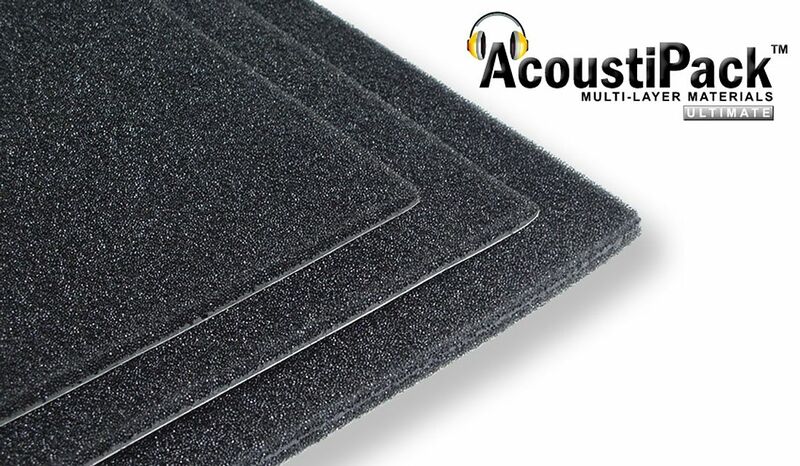 Acousti's new multi-layered composition has a low reflection upper surface (opposite the noise source) with a high density plastic acoustic barrier layer either 'suspended' in the centre of the acoustic foam layer, or at the base of the composite. Both 2- and 3-layer composites offer excellent sound energy attenuation because multi-layer composites are more effective than single layer soundproofing materials. AcoustiPack™ composite materials are dense but still flexible, and come with a strong self-adhesive backing. The soundproofing materials come with instructions and can easily be cut to shape before fitting. Unlike other noise reduction materials, the 'pick-and-place' self-adhesive allows the installer to have a second attempt at positioning the materials if they make a mistake first time round! The acoustic materials, including the adhesives, have been carefully selected and thoroughly tested to meet stringent UL94 international flammability standards. In this respect they lead the market in quality and safety. AcoustiPack™ ULTIMATE PLUS (APU+) sets a new standard for PC soundproofing material kits, where maximum noise reduction is required in a limited space. 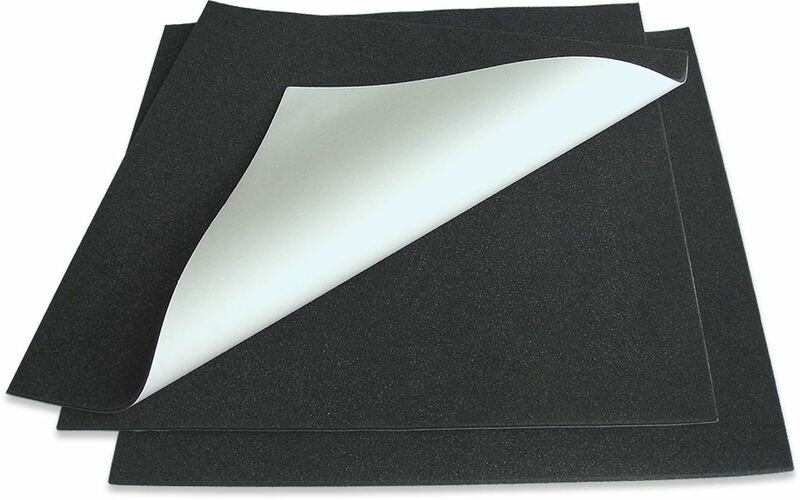 This multi-layer materials kit includes three sheets; two 2-layer (4mm thick) sheets and one 3-layer (12mm thick) sheet made from Acousti's latest generation materials, providing superb levels of noise reduction. This soundproofing kit is designed to reduce the noise emanating from noisy PCs with case sizes ranging from standard ATX up to larger E-ATX and even pedestal server cases used by gamers, power-users and small business users. AcoustiPack™ LITE (APL) is a cost-effective multi-layer soundproofing materials kit for standard and small size computer cases, including HTPCs and small form-factor (SFF) cases. Each pack contains two large sheets of sound-proofing materials made from a unique 4mm (2-layer) acoustic composite. This material is ideal for fitting within the narrow confines of modern enclosures, yet it has superb noise reduction capabilities. The upper layer (immediately opposite the noise source), is a layer of semi-open-cell dense acoustic foam which provides a low-reflection surface. This upper layer of foam provides some sound attenuation, especially of higher-frequency sound (above 1kHz). The very dense black limp 'plastic' layer at the base of the 2-layer material is directly attached to the substrate. This layer acts as both an acoustic barrier (effectively attenuating the transmission of sound energy through the material) and a damping layer, reducing vibration in the substrate (usually a thin steel panel in many PCs and server enclosures). In AcoustiProducts' latest generation of 3-layer composite, the dense acoustic barrier layer has been 'suspended' away from the substrate in the centre of the acoustic foam. The construction layering is like this: (noise source) acoustic foam -> acoustic barrier -> acoustic foam (then the substrate, which is usually a metal sheet panel). Sound energy first hits the upper foam surface, which is similar to the 2-layer construction, in that it is a low-reflective soundproofing material which is particularly effective at absorbing high frequencies. The sound energy then encounters the central suspended barrier layer, which is decoupled from the substrate. This high-density high-mass layer acts as an acoustic barrier mass to the transmission of energy through the material. The third layer of foam acts to suspend the barrier layer a small distance away from the substrate. AcoustiProducts' engineers found from both small scale impedance tube and larger scale reverberation chamber acoustic tests that the suspended central acoustic barrier effectively increases the absorption of low frequency noise (under 1kHz). This may well be a result of the 'mass-spring effect', where low frequency energy is absorbed by the sound 'moving' the layer when it is excited by certain resonant frequencies. Image shows the three sheet supplied with the APU, 2x 2-layer and 1x 3-layer sheets. APL is supplied with 2x 2-layer sheets. Acousti have also made a single 3-layered sheet available separately, so if you require just a single sheet then this is ideal! Also available are a set of three Acoustic Foam Blocks which can be used inside any vacant drive bays to help increase the absorption of unwanted sound energy. We believe that AcoustiPack™ soundproofing materials are the most effective on the market. AcoustiPack™ materials are perhaps not the cheapest, but we have confidence they are the highest quality and most effective available! Has quietened an old computer case. Although there is an air flow opening on one side of the case, it has made it quieter. I would have bought the 3 layer one had the air opening (lets some sound out) not been there. Shipping was a lot more for the heavier material so I didn't think I would get my money's worth. I wanted to keep some airflow through the case. A hot computer can be loud computer not to mention the wear and tear on parts. This stuff definitely makes my (cheap) case less tinny. It was easy to use, as long as you don't try to move it after application - get it right first time. I have no idea whether the thicker material would be any more sound-deadening, but this at least does the trick. I have tried other sound proofing kits but this one makes a marked difference leaving my PC very quiet. Used in combination with quiet fans, graphics card and HSF then you can expect a good result. well recommended and worth paying the extra for. I'd recommend this for any large case, especially for lightweight metal side panels to prevent any vibrations, and dull down any potential noise from inside.